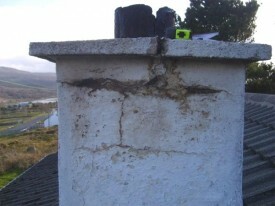 Chimney damage insurance claims, Donegal. CCTV chimney surveys & guidance for the filing of a chimney damage insurance claim - futureflue, Ireland. Chimney Damage is often covered by the house insurance policy, this will cover the necessary works required to return the property to its preloss condition. Internal water damage can occur where a lead flashing has failed or where there is cracking to the chimney stack structure. Water can make its way through the chimney structure causing damage to internal walls. Futureflue carries out a full inspection of the chimney and flueshaft to ascertain any damage. Water ingress and mould growth on internal wall surfaces. If any damage can be seen or your chimney is not performing as well as it should be then contact us and well be happy to advise you over the phone, and if necessary arrange an inspection.